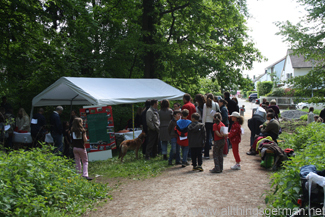 Last Sunday saw a flurry of activity in the woods between the northern end of Oberursel and nearby Oberstedten. Several hundred children and parents from the local Waldorf school were holding a sponsored walk to raise money for a school in South Africa. Although the school itself borders on the area, the start was actually located some distance away in the woods itself – signs led those like myself who had gone to the school instead from the gates along a trail to get there. Once at the check-in point, the walk itself took a circuit that was about 1 km long, with the walkers being sponsored on a per-lap basis. Over 300 people were expected to take part.